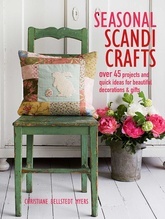 Charm and beauty abound in Seasonal Scandi Crafts, which is chock-full of 45 home décor crafts inspired by Scandinavian seasonal traditions. Using collage, embroidery, painting, sewing, and more you can make sweet and unexpected items like a hanging flower vase with a lace flounce, an easily embroidered framed Easter bunny, a fabric bunting with pockets for posies, a wreath made from heart shaped cookie cutters and molds, a weighted outdoor tablecloth, nautical patchwork pillows, a ragdoll witch with twig arms, a pumpkin appliqué pillow, a decoupaged wooden hanging advent tree, a pinecone mini wreath, heart-shaped lavender sachets, and many more darling ideas. Many of these projects can be done in a day!